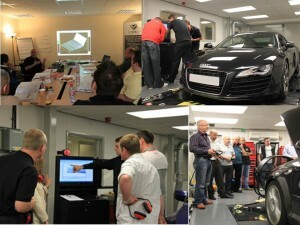 New Viezu Courses set for 2013 Through the Viezu Technical Academy courses you can learn the art of vehicle tuning. The award winning Viezu Technical training team will take you step by step through the art of writing custom tuning OE ECU files, tuning for performance, Co2 reduction, motorsport and vehicle modifications. The car tuning training courses take place at a number of facilities around the world, and of course feature dyno tuning and training programs for Ferrari, Porsche, BMW, VW, Mercedes, Audi and many more. The Viezu car tuning training covers all methods of tuning, from ecu remapping, chiptuning, to OBD tuning, to the latest Tricore BDM tuning processors, all are explained in simple to understand terminology. The training includes a lively fun mix of classroom study, hands on exercises and detailed live dyno tuning time, so you can learn and develop your own tuning in a safe, hands on dyno tuning environment. You can see more details on the courses at www.viezu.com/viezu-academy and www.remap101.com we are here to support you all the way. We also offer excellent packages of tunings system, training, equipment and software.